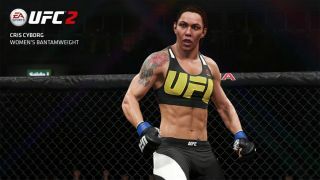 EA Canada has released a new title update for UFC 2, which adds three fresh fighters, some neat gameplay tweaks, and an entirely new mode: the Live Event Competiton. Live Event Competition gives you the chance to challenge other players in matches based around upcoming events. For instance, with UFC 200 happening (in real life) on 9 July, all wins and losses count towards a leaderboard from which the best players will enter into a Grand Tournament Final. That will take place at the Las Vegas-based event, with the winner crowned EA Sports UFC 2 World Champion. The clever part of this mode is that all fighters share the same attribute levels (92 overall) and move levels (level 2), with competitors able to customise their representative with five perks from a list of ten. So it really is based on gameplay skill, rather than choosing the best most powerful in-game character. For a detailed explanation of how it works, click here. The three fighters added as part of the update include two females and one male. Fresh off her UFC 198 win at the weekend Cris Cyborg expands the women’s bantamweight selection, along with Kyrgyzstani kickboxer Valentina Shevchenko. On the men’s side, hand-to-hand expert Albert Tumenov brings his 17-3 MMA record to the welterweight division. Gameplay tuning elements include general improvements to AI and referee behaviour; a fix for the annoying issue where fighters could regain stamina by spamming transition fakes on the ground; and a third transition for the submissive fighter in a Back Sitting position. The full list can be viewed on the UFC 2 website. The title update is live now, and should download automatically on launching the game. UFC 2 is out now for PS4 and Xbox One.